Environmental and fishing groups filed their challenge June 17 to the newest incarnation of the federal plan to keep Columbia Basin dams going and ESA-listed stocks growing. Just two days earlier, counting was completed at Bonneville Dam for the upriver spring Chinook run--the third or fourth best upriver Chinook run (hatchery and wild fish) in the past five decades or so. The other top three spring runs all occurred after 2000, when the hydro BiOp was issued and this chain of perennial litigation began. Coincidentally, nearby ocean conditions generally shifted into a much more productive mode about the same time, but that hasn't helped federal attorneys defending the biological opinions designed to keep dam operations from "appreciably" reducing the likelihood of survival and of ESA-listed stocks in the Columbia Basin. The now-retired BiOp judge, James Redden, found fault with the last four tries, while getting more spill at dams and a billion dollars for more habitat restoration. According to their complaint, plaintiff groups say the latest plan is just more of the same. Echoing old criticisms of previous BiOps, the groups say the plan is top heavy with unproven benefits from habitat restoration (even though there is more of it), neglects the proven benefits of more spill at dams, and still uses the same "illegal" jeopardy standard the feds cobbled together in previous BiOps. The feds have maintained that as long as the stocks were "trending towards recovery," the standard was met. Redden never ruled the feds' jeopardy standard was illegal in any of his opinions. In his last ruling before he retired from the case in 2011, he said it was enough that the feds needed to add more specific actions to restore habitat after 2013, to flesh out the last five years of the BiOp, and that is what they have done in the latest supplement released last January. In a footnote to his 2011 opinion, Redden acknowledged he must abide by a recent decision to defer to agency expertise, Lands Council v. McNair, 2010. But he said he was troubled by the lack of scientific support for the feds' estimates of specific survival benefits from habitat improvements, and noted that NOAA Fisheries acknowledged benefits might not accrue for many years, "if ever." He said the court was not required to defer to uncertain survival predictions that were based on unidentified mitigation plans. But the feds said they were doing the best they could. Other than general studies that found more smolts were produced when habitat was improved, they argued there was little real science to guide them in their efforts to quantify benefits. Now the plaintiffs are picking up on that Redden footnote, and contend that the expected benefits from habitat restoration are too optimistic. They cite NOAA's own judgment on the subject, that habitat benefits were not really based on science, but neglect to mention that the federal scientists said this was because there was so little science on the subject, not that it was particularly bad science. The plaintiffs cited a review of the habitat actions by the region's independent science panel, the Independent Scientific Advisory Board (ISAB), which stressed the uncertainty of successful outcomes and development of quantitative objectives. "NOAA cannot rationally continue to rely on the positive quantitative impacts of tributary habitat restoration that may not accrue or be detected for decades, if ever," the plaintiffs said, "while dismissing the available quantitative and other evidence of the negative effects of climate change that are already occurring and will increase over the same time period. Indeed, the available evidence shows that the declines in habitat productivity from climate impacts are likely to more than offset any benefits from many of the tributary habitat improvements NOAA has concluded are necessary to mitigate for the adverse effects of current hydrosystem operations in order to avoid jeopardy." The new complaint also chided the latest BiOp for ditching the court-ordered spill regime that had been in place since 2006. The feds said their analyses showed that ESA-listed steelhead would benefit from reduced spill, since more would be routed to barges, where survival to adulthood beat the odds from river migration. 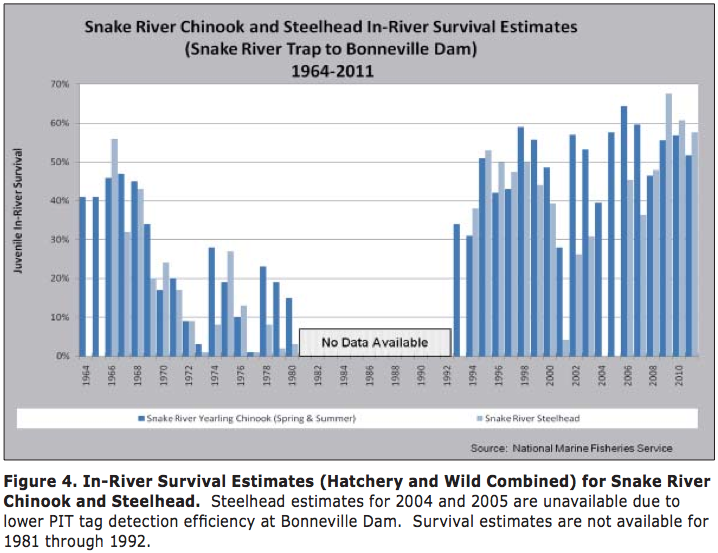 The feds made no bones about it--they said the court-ordered spill regime had reduced the numbers of returning Snake River steelhead compared to the BiOp spill regime. But on June 12, the feds announced they would maintain the court-ordered spill program through this year, which also means there will be no chance to reduce expensive summer spill before Aug. 31. Insiders say it was a largely strategic move to keep plaintiffs from filing a motion before the new BiOp judge, Michael Simon, in an attempt to reinstate the old spill regime. The plaintiffs' complaint also supported the Comparative Survival Study (CSS) spill proposal, which calls for a 10-year test that would bump up spill to 60 percent at most dams. While proponents claim this could raise adult returns to recovery levels, the idea was thoroughly panned last winter by other experts, including the ISAB, who did say it offered some merit if a long list of problems with its study design could be resolved. In truth, hardly anyone seriously believes those problems--some statistical, some experimental--could ever be overcome. So far, no one from the CSS side has approached Action Agencies with any overture toward resolving those shortcomings. The plaintiffs fail to mention any of those shortcomings voiced by the ISAB review. They simply note the science panel's conclusion that "the increased spill hypothesis stands as a possible candidate for testing." BPA had estimated the cost of the spill test would run in excess of $100 million a year. After the ISAB review, the CSS proposal--pushed by Oregon and the Nez Perce Tribe--did not make it into the draft of the latest revision of the region's F&W program, now under way at the Northwest Power and Conservation Council. The feds said they are not surprised by the latest challenge. "We have made clear and demonstrable progress in rebuilding salmon and steelhead runs throughout the Columbia Basin, and we fully expect this substantial progress to continue," Katherine Cheney, the West Coast Region Communications and External Affairs Office Branch Chief for NOAA Fisheries, said in a June 17 statement. "We are not surprised at the litigation, but we are disappointed at the prospects of yet another cycle of litigation, which only distracts from implementing projects on the ground. We will continue to work collaboratively with many regional partners to ensure the protection and restoration of these important fish and their habitats now and well into the future, and we encourage all to join in that effort." But the feds didn't mention anything about an effort they spearheaded last year to develop a more collaborative atmosphere with plaintiffs and other regional stakeholders in the salmon recovery process. The effort included intensive interviews and an attempt at the development of consensus goals. A report on the effort concluded the need for a "salmon czar," a public figure who could champion the cause and "provide vision and leadership and assemble the resources to move forward." But the report also recognized that "the long history of work on these issues had led to a palpable process fatigue among many parties. They [interviewees] were concerned that the perceived lack of progress and the lack of obvious success stories were contributing to a feeling of exhaustion and disengagement among both the general public and funders." With fresh litigation over the latest salmon plan in both the 9th U.S. Circuit Court of Appeals and Oregon's federal district court, it seems the plaintiffs are in no mood to stop arguing, despite their own call for more collaboration. And with a new judge presiding in the U.S. District Court action, coupled with the same old science adviser who pushed increased spill in Redden's court, the feds seem in no hurry to instigate a skirmish over summer spill, even though NOAA's own cutting-edge research is showing that freshwater conditions, including added spill, hardly correlate with increased adult returns when compared to biological and climatic conditions in the ocean. "They are hardly being dragged into court," said Terry Flores, executive director of Northwest RiverPartners, in a June 17 statement. "They are the ones bringing the litigation, despite unprecedented support for this latest salmon plan from federal and state agencies and more than a dozen Northwest tribes." And what about dam breaching on the lower Snake? This long-term goal of the plaintiffs is mentioned only once--in the context of the complaint's review of Redden's decisions. The judge sent a letter to all parties in 2009 outlining his initial thoughts on the adequacy of the 2008 BiOp, suggesting the Action Agencies develop a contingency plan "to study specific, alternative hydro actions, such as flow augmentation and/or reservoir drawdowns, as well as what it will take to breach the lower Snake River dams if all other measures fail." The 2008 BiOp did contain language to study dam breaching on the lower Snake if runs declined significantly, and a study plan has been developed as a last resort. But the Nez Perce Tribe and others have argued that the dam breaching contingency was designed to trigger too late to do any good. Part of that study plan called for development of models to study the effects of breaching on salmon survival. NOAA Fisheries scientist Rich Zabel, director of the agency's fish ecology division in Seattle, said the agency's COMPASS model has been modified to simulate free-flowing conditions, so NOAA's obligation under the 2010 supplemental BiOp has been satisfied. Sometime in the future, Zabel said, the model will be run to estimate effects on fish survival of breaching dams on the lower Snake, from speedier fish passage, less predation, and earlier estuary timing. With the record returns of fall Chinook to the lower Snake in recent years, that may not happen anytime soon. The June 17 supplemental complaint was filed by Earthjustice on behalf of the National Wildlife Federation, Washington Wildlife Federation, Idaho Wildlife Federation, Sierra Club, Pacific Coast Federation of Fishermen's Associations, Institute for Fisheries Resources, Idaho Rivers United, Northwest Sportfishing Industry Association, American Rivers, International Federation of Fly Fishers, Salmon for All, NW Energy Coalition, and Columbia Riverkeeper.